This expansive view of the city and harbor was taken from the top of Corcovado. 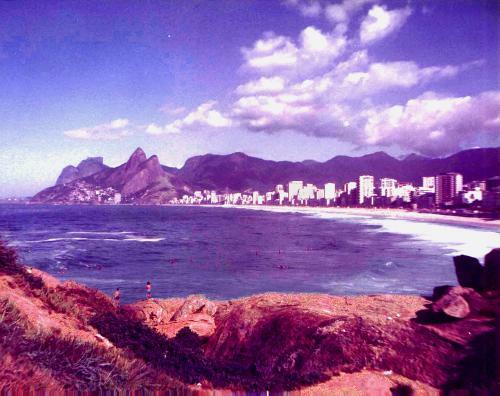 When I visited Rio de Janeiro in 1985 it was like paradise to me. After a long overnight flight from New York City we arrived in Rio mid-morning and caught a cab to our oceanfront hotel. Half-delirious from exhaustion and excitement, I remember lots of greenery and flowers sparkling in the sunshine. The beaches were glorious and the warm breezes coming in from the ocean couldn't be more captivating. 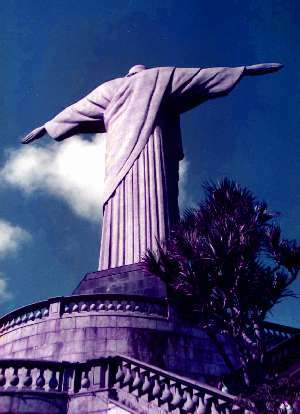 This world-famous statue of Christ the Redeemer graces the top of Corcovado and can be seen from all over the city. Every morning we woke up to breakfast served on the patio overlooking the beach. After a hard day of soaking up the sun and gandering at the scantily-clad sunbathers, we usually walked a couple of blocks into town and enjoyed an hour or two of people-watching in a sidewalk cafe drinking caiperenhas, a drink which tasted like lime ade but packed an unbelievable wallop. At night we walked along the beach and watched the lights of the houses on the mountainsides come on, covering them like a blanket of twinkling stars. Above in the sky, the beautiful and exotic constellations of the southern hemisphere skies called to me like brand new friends. Another world-famous, beautiful beach. The name itself conjures up images of exotic sensuality and romantic samba music. The sunbathers are the most beautiful people in the world. At the time the exchange rate for the US dollar was so ridiculously high we were filthy rich. We we able to buy full-course filet mignon dinners - including everything from salads to desserts and coffee - for the equivalent of $2.50. To this day I have not lived so affluently or so pleasantly. 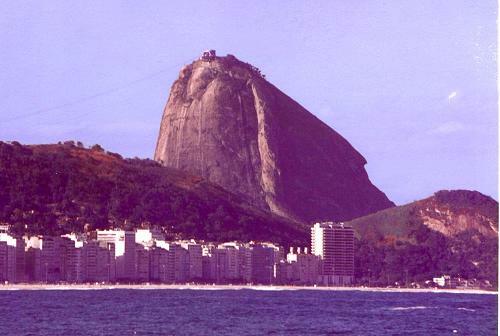 Sugarloaf (Pao de Acucar in Portuguese) looms above Copacabana Beach. Sadly, Rio is now a city choked in crime and poverty. Then as now, the grinding misery of the favelas, or hillside slums, is a jolting, incongruous contrast to the beauty and glamour of the many beaches. 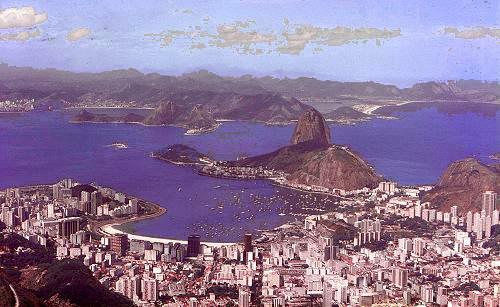 Rio will never be as I remember it from 1985, but the memories of the most beautiful and romantic city I have ever visited will stay with me forever.